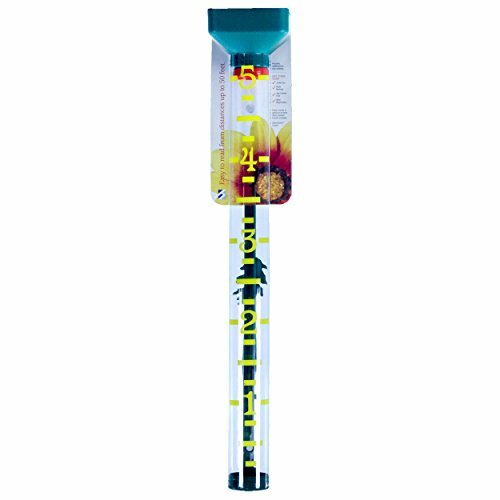 Headwind EZ Read Jumbo Rain Gauge - Accurately Measure Rainfall from a Distance - 20" Plastic Gauge. Monitor the precipitation right in your own backyard with the popular and recognizable EZ Read Jumby Rain Gauge, from Headwind Consumer Products. Homeowners, gardeners, and amateur meteorologists alike will love the ease of using this iconic rain gauge. At 20" tall with brightly colored numbers and float, accurate readings can be taken from up to 50 feet away. Not more muddy boots just to check the rainfall! Using the included hardware, mount the rain gauge in the most open spot in your yard and enjoy the convenience of monitoring the rain from the comfort of home. The patented DebrisGuardTM Funnel prevents rocks, twigs, and other yard debris from entering the tube of the rain gauge and throwing off your readings. This highly visible, large "EZ to read" gauge is a perfect gift for senior citizens or those with visual impairments. Smaller rain gauges can not compare to the easy use and readability of this rain gauge. Specially calibrated to ensure accuracy, this is a must-have tool for anyone needing to accurately assess the rain fall in their area. Includes 20" tall rain gauge that measures up to 5" of rain fall and hardware for mounting in the ground or on a vertical surface. If you have any questions about this product by Headwind, contact us by completing and submitting the form below. If you are looking for a specif part number, please include it with your message.